good article,it looks nice the cake in there,I will talk to my girlfriend to do also this cake. Every week we used to make cookies in home which is the best of taste other than buying from shop.. I am going to try this and see how it turns out! Iâ€™m pissed off now, I wish there were som girl scouts where I live to sell me some cookies. I guess Iâ€™d better go and make some of my own. Sigh. Of course, I expect to leave any day, when the Hopkins Park Plaza opens up. There’s 10 an hour and the hours are nine in the morning till “whenever,” which I am hoping can be defined as a little before two. The room itself, just down the hall from the “kitchen,” is half the size of my little outpost in Motel 6 and contains two unmade twin beds, a two-drawer chest, a couple of light bulbs on the ceiling, and nothing else. Thereâ€™s 10 an hour and the hours are nine in the morning till â€œwhenever,â€ which I am hoping can be defined as a little before two. These were out of sight. They were rich and chewy, and better than the Girl Scout version. I made the bar variation instead of the cookies. The recipe was easy to follow, but I advise spreading the caramel/coconut topping while warm and with lightly floured fingers. Using floured fingers helped me spread the filling to the edges more easily than using an offset spatula. This recipe will definitely stay in my files for family weekends and Christmas giving. Thank you for this recipe!! I love making “prepared” foods from scratch (at least I know what is in them) and this was perfect. 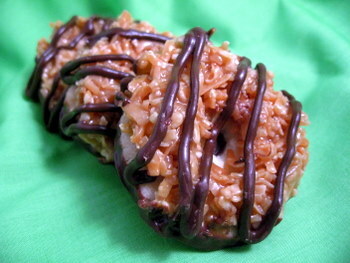 I made them yesterday and put them in the refrigerator (we like our Samoas cold) and this morning they taste like heaven. I just made these cookies, but I cheated and bought Keebler’s Shortbread cookies due to my time schedule and heat factor. I dipped the bottoms into dark chocolate that I melted from little discs that I bought. Then I went ahead and finished the recipe for the topping the way it said. I think mine look better and taste better then Girl Scouts cookies do any day!!!! The thin mints are my favorite. They are wonderfull. hi, could someone help me out? i made this recipe, and i added enough flour to keep it from being sticky, but the dough spread everywhere! any advice would be great! 🙂 they were still good, although i couldnt frost them due to the fragile state they were in. Heyy! great pics—they look professionally taken–and the cookies even yummier!– and the cookies look delicious! This cookie really looks awesome. I will definitly try the receipt at home. Hi Nicole, the cookies looks very good…yummy. I just made these and not sure how i messed them up. The chocolate would not melt, i used semi sweet. Then i tried adding some 1/2 & 1/2 to hit to help it from clumping. The caramel was falling off the cookies too. Any suggestions? Just made these cookies. They are amazing but you were not kidding about being time consuming. the best part is that my fiancÃ©e, who has peanut and tree nut allergies and cannot have girl scout cookies, loved them. It was her first time having something of the sort in half a decade. I love your site and I love that you have provided us with the opportunity to have “girl scout” cookies again. just finished these cookies about 10 minutes ago, they are wonderful! EXCEPT i cheated a little.. instead of rolling them out and cutting them, i rolled into balls and pressed lightly on the center (with a round object before they went in the oven and right as they came out- again.) i then made my coconut/caramel mixture and when my cookies were done i put the mixture in the center of the cookies and drizzled chocolate as per the recipe. this made a nice and firm stable cookie and i did not dip the bottoms in chocolate. thanks for the recipe!! These look amazing! I can’t wait to try them out…happy holidays! Wow! These are my favooorite cookies! I have to try these! I used bark chocolate. It was way easier to work with. The cookies have to be completely cooled before you start dipping and putting the Carmel and coconut topping on. Like it says it’s time consuming and you have to be patient. I made these and they were very good. Everyone at work enjoyed them. They have asked me to make the Tag-Alongs next. Hope they come out as good as the Samoas! I could KISS YOU! This recipe was so easy. I love making my own caramel so I spent the few hours doing that, and these cookies are THE BEST THING EVER!!! These are my favourite, and my step dads (whose samoas i ate quite a few) so im bringing him a batch. Thanks for posting this! WONDERFUL! I’ve been dreaming of a recipe such as this, but never imagined I could find one. Now, that I’m a chocolate blogger and enjoy reading other blogs, I happened to have the good fortune to come across your blog and your homemade Samoa recipe! Yay! I was a girlscout back in the day and these still remain my favorite girlscout cookies – love that your recipe is a healthier version. Since I’ve been living in Mexico the last 5 years I’ve had to go without, that is until now. Thank you! 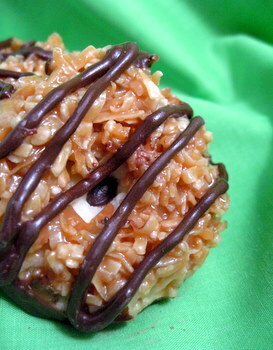 » Homemade Girl Scout Cookies: Samoas.